First: Happy Valentine’s Day! Whether you are single or have a partner/pet/family to celebrate with today, know this: you are LOVED. You are loved and you have love for others. It is a fact. Now go share that with someone. It feels great. BodyCombat class at Gold’s Gym. I feel powerful, pushed to my limits, and all to the tune of some sweet beats. Morning cup of coffee. I add a dash of cinnamon (anti-inflammatory perk! ), splash of organic half and half, and sip slowly as I tackle the day. Bath Night. Very recently…I bathed for the first time in seven years. I avoided the bathtub like it was some big all-night production. It is not. It’s now a weekly must-do. At a minimum, all you need is hot water and epsom salts, for crying out loud. I have a salt/lavender oil/rose-hip blend that I made myself. Whether you spend 10 minutes or 60 minutes soaking… it’s worth it. Saturday Night Live. In my 20’s, I spent Saturday nights out in LA/New York Cty L-I-V-I-N. Now I am 30, in Pittsburgh, and I want nothing more than to stay IN on a Saturday night and watch SNL as it airs. The world needs a laugh right now more than ever, and I salute the comedy gods committed to making that happen. JESUS. I’ve been a follower my whole life and give credit to the Big Guy for teaching me how to be compassionate, understanding, and fearless. Big shout out to Vineyard Church of Wheeling and my Women’s Small Group Study here in Pittsburgh for the fellowship and support! 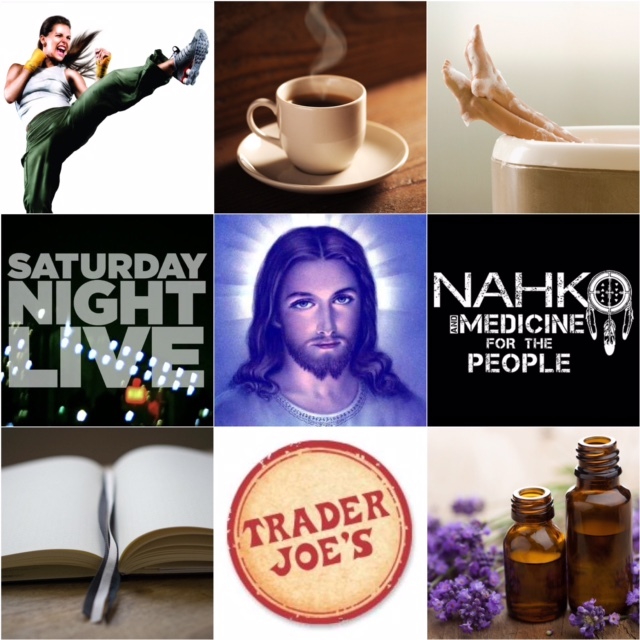 Nahko and Medicine For The People. I have listened to his albums on repeat for the past 6 months. First and foremost, Nahko is an activist/poet, and he happens to be an amazing musician because of it. This particular song, Manifesto, is a good antidote to today’s “cultural woundin”. . Writing. I invest time every single day to write down something personal. It is usually a strand of “to-do’s” coupled with a thought or idea in my journal/agenda book. Trader Joe’s. I am in this store at least once a week, because I love it so so much. The shopping experience, the quality food, the affordable prices, the snack shack… I love grocery shopping in general. If you hate it, then we’d be a perfect match to work together. Contact me and I’ll include a bonus ‘grocery-store tour’ in addition to a complimentary one-on-one wellness consultation. Lavender. This is my go-to when it comes to stress relief. This essential oil helps me with mood balancing and sleep quality. There are a number of other health benefits associated with organic lavender essential oil. Dr. Axe wrote a great article all about it. It is important prioritize self-care along with caring for others. If you are feeling unbalanced in the area or aren’t sure where to start, contact me and we’ll work through it together.